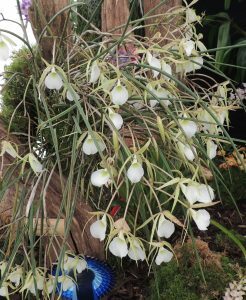 We gave a brief view of this species earlier in the week as it was one of our awarded plants at the Malvern Show. Here is some proper detail on one of our favourite old plants. 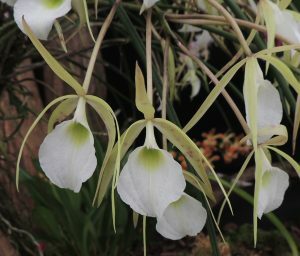 This terete leaved relative of Cattleya is native to Brazil where it grows in warm open forest in good light. It is relatively slow growing and we find it does best mounted where its long lived roots can grip tightly to the bark. We find it dislikes pots or baskets presumably because the roots cannot tolerate prolonged wet periods. 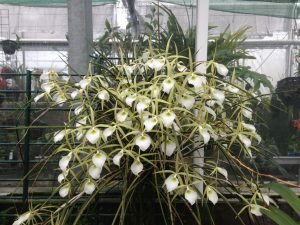 Saying this we find that mounted it enjoys being watered daily and when we have with held watering at flowering time the flowers have not opened fully – so mounted but well watered seems to be its preference in our greenhouse. It is certainly enjoying itself at the moment and has about seventy perfect large fragrant flowers completely smothering the plant. I think we have had this plant on this mount for about fifteen years and we are in no hurry to move it on. It hangs high in Warm Americas in good light and is very little trouble. We are delighted that the RHS Orchid Committee are impressed by the plant too.